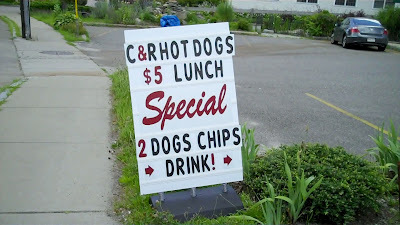 On July 14, I headed down route 16 to a favorite stop of mine in Holliston: C and R Hot Dogs- home of the $5 lunch special. C and R Hot Dogs is located at 459B Washington St, Holliston, MA in a small strip mall. He had a commemorative tee shirt made for my National Hot Dog Month tour! 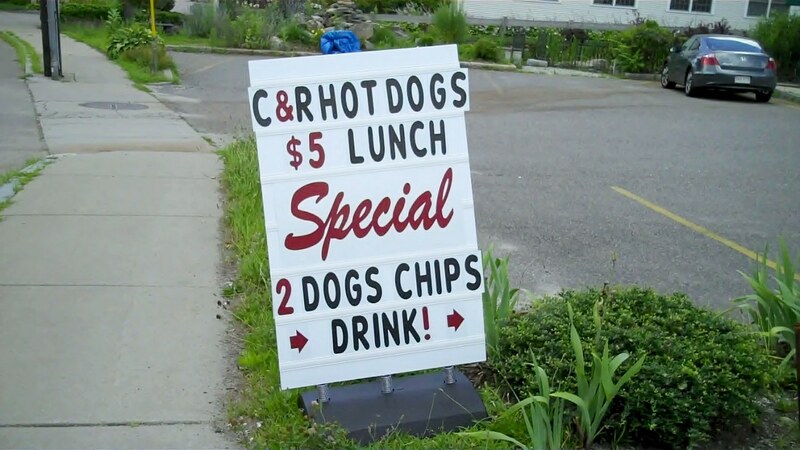 The menu features hot dogs. There are over 40 topping choices including three kinds of mustard, shredded cheese, squeeze cheese, chili, peppers, my favorite secret sauce and more. 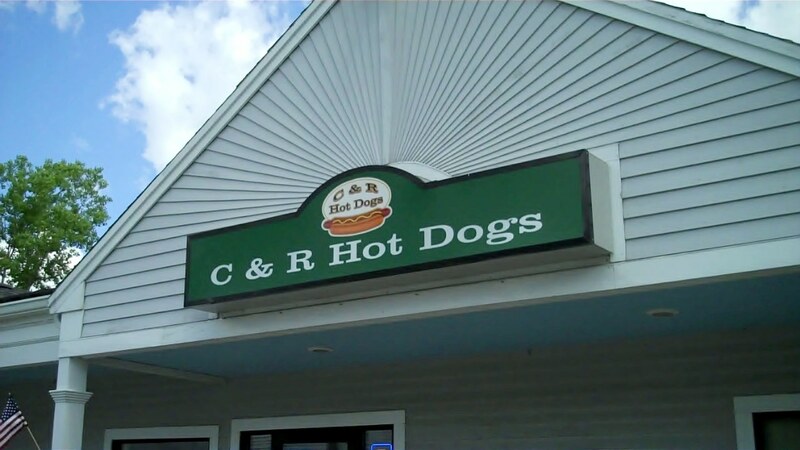 You can really have it your way at C and R Hot Dogs. 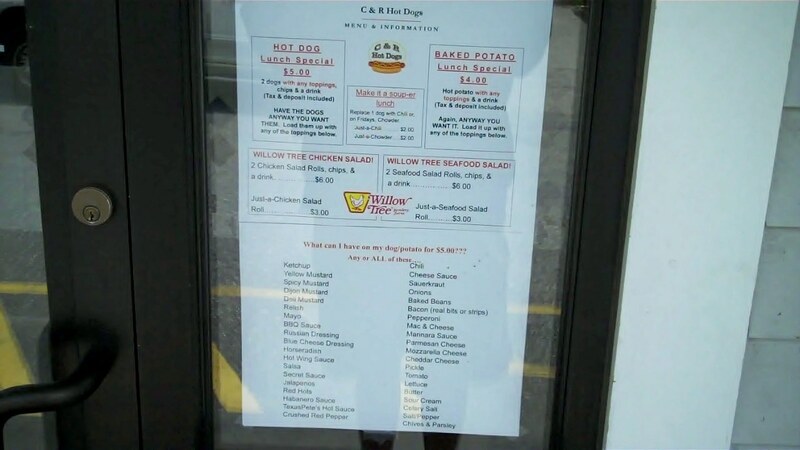 They also serve chicken salad, seafood salad, stuffed baked potatoes, soup (in the winter) and ice cream. 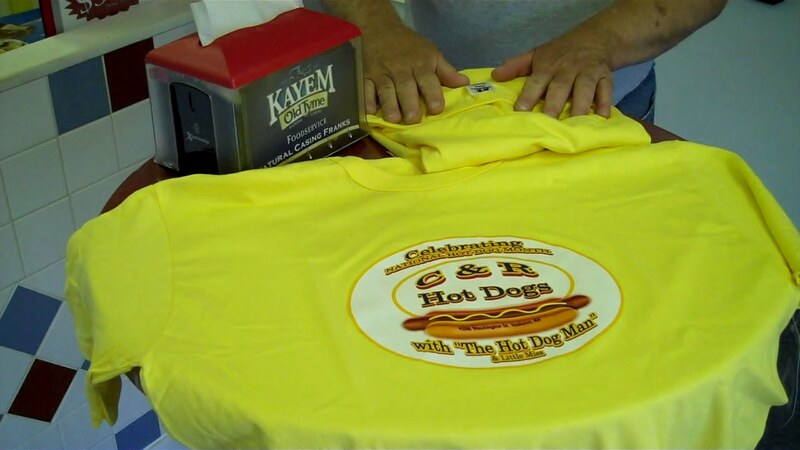 There's lots of fun and funky stuff in the shop, including this hot dog cut out. Here's a couple of Firehouse Dogs: Kayem Old Tyme franks topped with chili, cheese Tabasco habenero sauce, crushed red pepper, red hots, and jalapeno peppers. That's a five alarm lunch! Here are Frank's franks- two Secret Dogs. 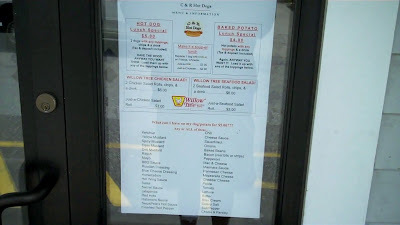 The Secret Dog is my favorite; it has C and R's "secret sauce," mayonnaise, and celery salt. 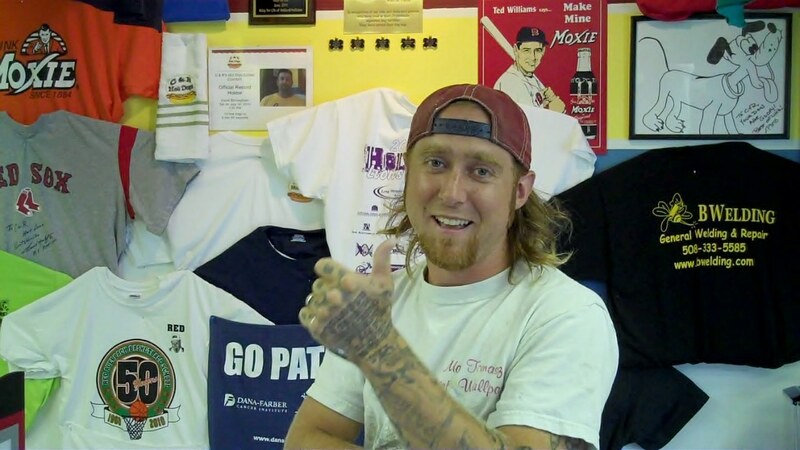 And here's Frank eating one of his franks. Frank's buddy, Matt Thomasz- a local painting and papering contractor- announced he wanted to attempt to break the C and R hot dog eating record. 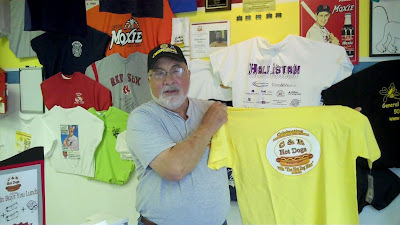 C and R has a running contest: if you can break the record by eating more than the current benchmark (10 hot dogs) in eight minutes, the hot dogs are free, you get a tee shirt, a framed commemorative certificate and your name and photo are placed on the wall as the reigning champ. Here's a box of ten hot dogs waiting for the starting gun. Did he make it? 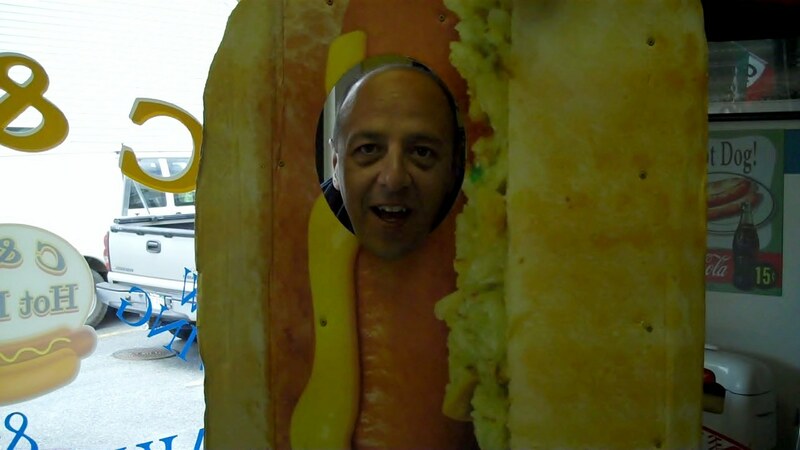 Check out the video on Hot Dog Stories to find out! 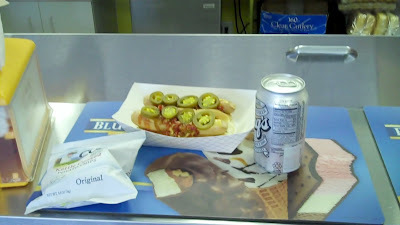 It WAS yummy- it's my favorite hot dog at C and R.
Stop by C and R Hot Dogs and grab a Secret Dog, or make up your own combo. 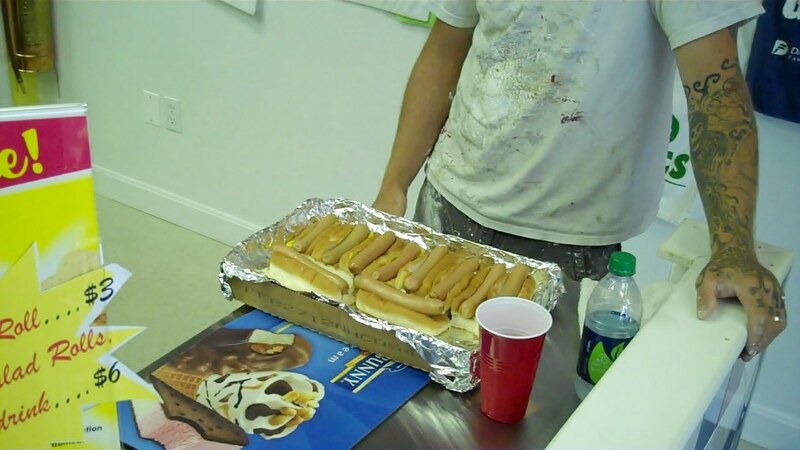 Make sure you tell them "the Hotdogman" sent me. 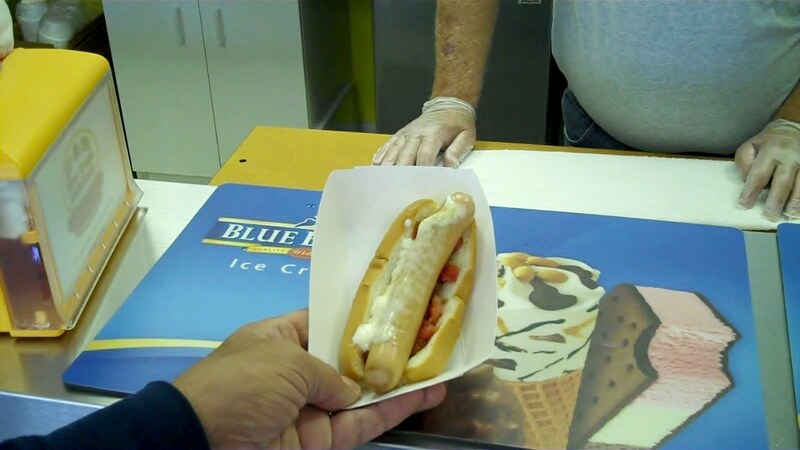 HAPPY NATIONAL HOT DOG MONTH! Be sure to check out the video of my visit to C and R Hot Dogs on Hot Dog Stories.